This pound cake is a rich, dark brown outside, with an ultra-fine, golden crumb. 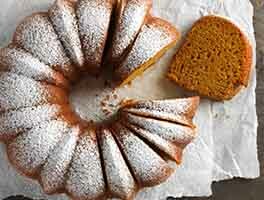 It mimics closely the original proportions that define pound cake: a pound each of sugar, eggs, butter (we use a combo of butter and cream cheese), and flour. If you like a dense, firm, loaf-shaped classic pound cake, then this one's for you. One non-traditional touch: the vanilla-sugar glaze brushed atop the cake towards the end of the baking time, which gives it a crackly-crunchy top crust. Preheat the oven to 350°F. Lightly grease a 9" x 5" x 2 3/4" loaf pan, or a 12" x 4" x 4" tea loaf pan. To avoid overflow, be SURE to use the correct size pan! In a medium-sized mixing bowl, beat together the butter, cream cheese, salt, sugar, baking powder, vanilla extract, and almond extract until well combined. Add the eggs one at a time, beating well after each addition; the mixture may look slightly curdled/grainy. After you've added the final egg, beat at high speed for 3 minutes, then stir in the milk. Add the cake enhancer, then sprinkle in the flour gradually, with the mixer going at low speed. Mix just until combined. The batter will be smooth and thick, but still pourable. Pour and scrape the batter into the prepared pan. To make the topping, combine the sugar, vanilla, and water. Stir until the mixture is syrupy. At first it'll seem very stiff, but will become "drizzlable" as you stir. Set the topping aside. Set the cake on a baking sheet, for easiest handling and as a precaution against potential overflow (which shouldn't happen if you use the correct size pan). Bake it for 55 minutes (for either size pan). Remove the cake from the oven, and brush/drizzle with the sugar mixture. Return the cake to the oven for an additional 15 to 20 minutes. Remove the cake from the oven, and set it on a rack. Insert a toothpick into the center; it should come out clean. If you use an instant-read thermometer, the center should register about 200°F to 205°F. The very top, right under the crust, will still be kind of soggy; don't worry about it. After 5 minutes loosen the cake's edges and turn it out of the pan to cool completely on a rack. Drizzle with the topping mixture while the cake is still warm. Store wrapped at room temperature for 2 days, or freeze for longer storage. If desired, substitute 1 tablespoon lemon zest + 1/4 teaspoon lemon oil, OR 1/8 teaspoon Fiori di Sicilia flavoring, for the vanilla and almond extracts. 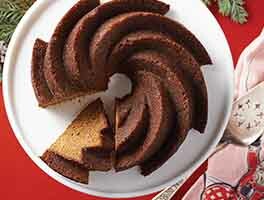 For a different look, bake the cake in a 9-cup tube or Bundt® pan. You'll need to bake it a shorter amount of time than in the loaf pan, so start checking at 45 minutes. Since this cake is so dense, the baking time can be tricky. You want it thoroughly baked, but not dried out. When the cake is done, a cake tester inserted into the center will come out clean, and the internal temperature at the center will be at least 200°F. The top 1/4" or so of the top crust may still be moist and sticky; but it shouldn't be batter-like. 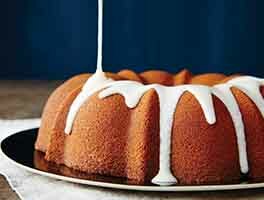 The finished cake may have some moist streaks near the top crust; that's OK.
You'll find bringing the butter and cream cheese to room temperature makes them easier to beat without lumps forming. And room-temperature eggs help keep the batter lump-free, too. It takes about 2 to 3 hours to bring these ingredients to room temperature, so plan ahead. 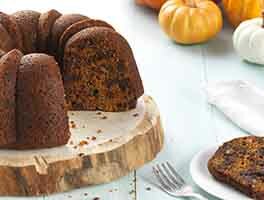 This cake is wonderful sliced, warmed, and served with ice cream and berries, or hot fudge or caramel sauce. Lightly butter individual 1"-thick slices of cake, and toast (both sides) on a clean outdoor grill over low heat until just a tiny bit crispy. Alternatively, fry gently (like a grilled cheese sandwich) in a skillet. Serve immediately, topped with ice cream and the garnishes of your choice. 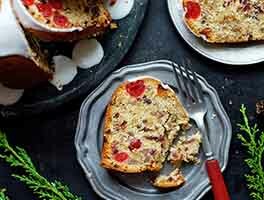 Our Gluten Free Measure for Measure Flour makes it easy to make many of your favorite traditional recipes (like this one) gluten-free. Simply substitute Measure for Measure flour 1:1 for the flour called for in your recipe; no additional ingredients or other changes needed. So easy to make, and a hit with my dad and husband. We served it up with fresh strawberries and whipped cream. I can't wait to make this again with some different flavor variations! I might have just found my new favorite base cake recipe :-) KAF, you are a wonderful baking resource! I wish I could give this more than 5 stars! I have baked countless GF cakes over the last four years, and this one is the best by far. I used a loaf pan, maybe 10x5, and it came out great. I just went with all vanilla because it was for my kids. Truly, this recipe is the best. Thank you! Awesome. Easy to follow instructions and turned out just perfect. Split the batter between 2 smaller pans and it worked out fine. Fresh cut strawberries have found their new home! can you bake it in a 9in cake pan? It was delicious, but I'd like to make it into 4 mini loaves next time. How do I adjust the cooking time? Baked as directed and it came out awesome! Great base for ice cream! 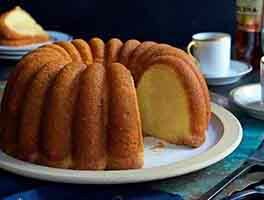 Delicious pound cake! I baked it today without the Cake Enhancer and substituting 1:1 the all-purpose flour for freshly milled wheat flour. It was a hit! Between my husband, my kids and some friends that came over today it it almost all gone already! They all loved it and me too! This is an excellent recipe. I made it today to serve with fresh peaches and whipped cream and it was so good. After reading the reviews I decided to sift the flour so I did not add too much and I am glad I did. The texture of the cake is firm but certainly not dry. It would be excellent with just a glass of milk or coffee. The only change I made was to omit the almond favoring and add 1/8th tsp of fiori di sicilia to the 2 tsp of vanilla, the smell is amazing and the you can just taste a hint of orange. Have to admit I just received the fiori di sicila in my order from KA this week so I had to add it. I think I will add it every time. SO DELICIOUS. Definitely far and away the best pound cake I've ever had, read, or seen in a movie. I bake all the time and can't stand those blechy-tasting store bought pound cakes, and am so very happy to have found a fabulous pound cake recipe. I'm planning to spoon some bourbon-macerated nectarine slices over a piece or two very shortly (as long as I manage to not eat the entire cake first!). Thank you, King Arthur Flour!